Our child has a (roughly) $25,000 RESP and will begin attending post-secondary in September. From what I’ve read, we don’t have to provide receipts for expenses, we just have to provide proof of enrollment to begin removing funds from the RESP. 2) The reason we’re asking (1) is it *seems* like it would be a good idea to take out any *extra* cash and divert it into a TFSA (Tax Free Savings Account). Do you know if there are any problems with doing that? First of all – the $5,000 withdrawal rule in the first term only applies to non-contributions in the RESP account. Contributions you can take out any time once the child starts school. Non-contributions are things like grants, capital gains, dividends, interest that have accumulated in the account. Second – as Jay notes, to do a withdrawal from your RESP, you only need to show proof of enrollment – no receipts for books etc. Jay wants to know if there are any other limits on withdrawals after the first 13 weeks, as he sounds like he wants to remove the money from the RESP as quickly as possible and put it into a TFSA. The answer is that no there are no limits. In fact, since you can take the contributions out right away, most people can take out a large percentage of the RESP in the first term and then clean it out entirely in the second term. Contributions are not taxable when withdrawn – it is only the non-contributions that are taxable. Withdrawals of non-contributions are taxed in the hands of the student not the parent. In Jay’s case, it sounds like he can probably withdraw all the money in the first two semesters without any problems. 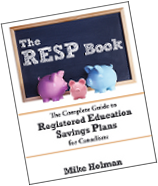 Check out my RESP rules page for more RESP information. I received a letter from James M. Flaherty’s office dated July 28 2010.They acknowledge general confusion about the TFSA but do I have to re-submit my correspondence to the TFSA Processing Unit asking for a waive of the interest charges, all over again, or wait for them to process it. I talked to a gentleman from the CRA this morning and he said to write them a letter and ask the statice of the letters previously sent. Anyone with knowledge about the latest letters sent to us? -Peter. Apparently, there is a “reasonable” limit to how much can be taken out of an RESP. If the student is in a technical course, taking out $20,000 (of non-contributions) may be considered “unreasonable.” If the student is in dental school, I don’t think there’s an issue. Remember, the purpose of the government’s grant is education, not a new car (as an example). Robert, what exactly is “reasonable”? Some technical courses can be quite expensive.